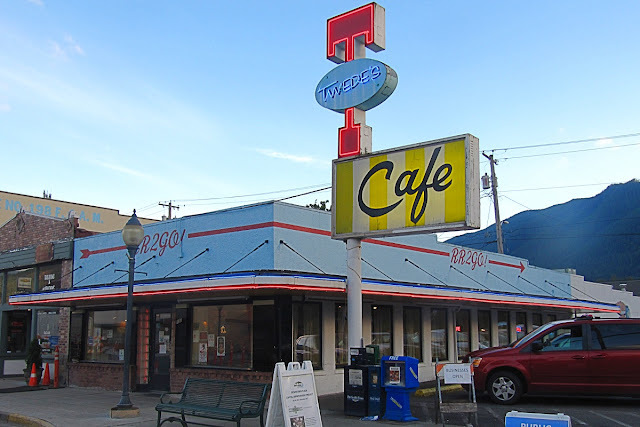 One of Twin Peaks' main locations was the local RR ('Double R') Diner. It was here that Special FBI Agent Dale Cooper (Kyle MacLachlan) would stop by at regular intervals to enjoy a 'damn fine coffee' and a slice of cherry pie. In the first two seasons, the diner was played by North Bend's Mar T Cafe which later morphed into Twede's Cafe -- used for the third season -- after a fire burned down part of the original restaurant. The various incarnations of the diner have been a big draw for numerous Twin Peaks fans who visit the retro-styled diner to sample the coffee and pie. Naturally, we did the same and I'm here to report that the coffee was fine, but the cherry pie a la mode was FREAKIN' AWESOME! Seriously, I don't even particularly like cherry pie but this pastry was a 10/10 on the pie scale.